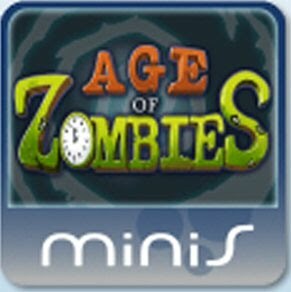 Age of Zombies is a PSP PlayStation Mini game that can also be played via PlayStation 3. PlayStation Minis are similar to X-Box Indie games I guess, though of a much higher quality, feeling more like Popcap style games. Age of Zombies is an arena based shooter in which you play as a time travelling wise cracking hard nut battling legions of zombies. The game starts with your character - Barry Steakfries confronting an evil Scientist at his HQ. Just before you kill him, he reveals that he has sent legions of zombies back to different time periods to mess up the human timeline. You jump into a nearby time portal determined to battle them all. The game is split up into around five different time periods. Each time period features three stages, the last stage of each period having a boss to defeat. The time periods all look totally different, and all feature exclusive enemies. 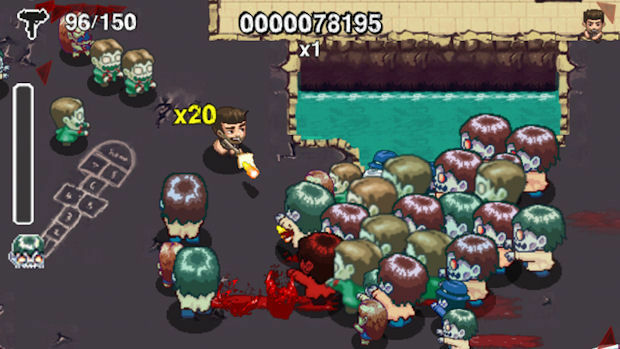 The basic aim of each stage is to defeat all the zombies. The time periods used include prehistoric, Egypt, 1930's, futuristic, and feudal Japan. In prehistoric times you get cavemen zombies, 1930's feature gangster zombies, Egypt has a multitude of mummies, the future level features zombie cyborgs, while feudal Japan sees zombie samurais, reminiscent of Panic in Wonderland. The music for each stage is fantastic and really fits the setting. Dotted around each level are various weapons. Your basic handgun can be briefly exchanged for a shotgun, rifle, submachine gun, flame thrower, or minigun, while your secondary weapon (by default grenades) can be exchanged for mines, and rocket launchers. When you pick up a weapon, a voice over tells you the weapon you have got, but this voice can change depending on the time period. Most noticeably in feudal Japan all the voice overs are hilariously bad, with a Japanese accent (such as 'oooooooh, machina gunna!' or 'shotagunna!') very very funny. The future level has a robotic voice over. There is a very basic story, and at the end of each stage Barry Steakfries has a little dialogue scene, usually some corny self aware Duke Nukem style quote. Some of these are just terrible, and not funny, but a lot of them are quite entertaining. The zombies come in many different styles. Basic zombies are the main enemy type, mostly it is the time period which dictates the other enemy types. Some of the gangster zombies have tommy guns, while ninja zombies can throw throwing stars, and cyborg zombies can shoot lasers. These enemies all come in bigger versions as well. Also mixed in with these are some enemies that move a lot faster, as well as glowing red enemies who explode when shot. The bosses are all cool, if predictable. 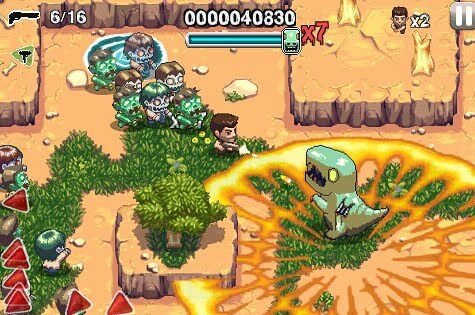 Man, this game has a zombie T-Rex! The bosses are fun to fight, and are quite varied in how you fight them. The game designed for PSP of course looks kinda rough on a TV, lots of jagged edges, but the cartoony style of the game is good despite this. The game cost £3.49, and for that price you get around two or three hours of game. 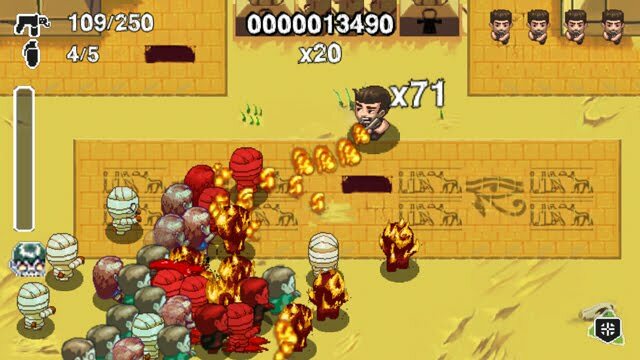 It is not hard, but is fun, zombies exploding into blobs of blood when shot, and sometimes the amount of zombies swarming towards you is immense, throwing a grenade into a throng of zombies then watching them all burst into flames never fails to be entertaining. Not a bad action shooter, I do plan one day on getting a PSP, so will try it out on that when I do to see if it's any better or worse on a handheld. As my first ever PlayStation Store purchase this was good, fun, if a little bit too brief.